It’s great to see more businesses recycling in their office, and also reusing the materials being recycled by purchasing recycled office supplies. In fact, the office products you use can make a real difference to our environment by reducing waste, carbon emissions, and being gentler to our earth. First let’s talk about recycling in your office. If you are not already recycling at your company, start today. Most employees want to participate because they already recycle at home, it’s simple to do, and it keeps paper, plastics and glass out of our already overcrowded landfills. Start by putting recycled bins around the office and even by employee desks. Recycling collection cans like the Rubbermaid RCP295673BE sell for under $8.00, and feature the recycled seal so it’s clear only recycled materials go here. For larger collection needs in break rooms or copy rooms, try Rubbermaid’s 20 gallon Brute recycling containers – item RCP262073BLU – for under $35. Or, simply reuse old cardboard boxes for collecting recycled goods, and tape the recycled triangle seal on the front. Once your business is recycling, it’s time to start buying recycled products. Many people are surprised to learn there is a glut of some recycled materials today because many people recycle at their home or office, but they are not completing the “recycling triangle” by purchasing items made from recycled material. You will make the greatest impact by switching to recycled copy paper, which is the largest volume paper item used in offices. While it costs a little more than virgin paper, it has the most impact and the savings for our environment offsets the price difference. 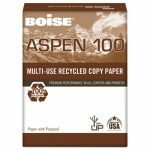 Zuma recommends Boise Aspen 100% Recycled Paper to go green. Zuma suggests Navigator premium recycled paper as our best value/quality recycled paper – item SNANR1120. It’s made with a “Super White” formula so it’s high brightness paper, and it contains 30% post consumer waste paper. Or, if you’d like to really go green, consider using Boise Aspen 100% – item CAS054922 – which is made from 100% recycled fibers. Binders and file folders are another high use office supply item, and Zuma features view binders, classification folders and hanging file folders which are all made from recycled material. These are available in national brands like Avery, Smead and Universal, and the nice thing with buying our store brand Universal is you can buy recycled content products and actually pay less! Now review your Break Room and Janitorial Supplies and identify paper items that can easily be switched to recycled products. We all know most companies don’t buy the softest premium paper towels and tissues for the office, so switching to recycled will barely be noticed. Marcal and Seventh Generation brands offer many products in this area, and Boardwalk has some lower cost recycled content alternatives. Bottle-2-Pen is made from recycled plastic water bottles! Printer paper, envelopes, Post-It Notes, file folders, binders, writing pads, paper towels, toilet tissue, napkins, paper cups. 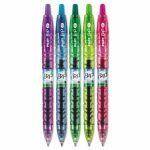 There are also many items using recycled plastic like Pilot B2P pens made with recycled water bottles, and the Bic Ecolution line of pencils, pens and correction tape. The good news is more people are buying recycled products than ever before, which is good for our planet and good for future generations. Let’s all do good work together by actively protecting our environment, first by recycling in the workplace, and second by buying recycled office and janitorial supplies that are used in bulk in your office. We are here to help with cross references and product suggestions to enable you go green at your business today! This entry was posted in Recycled Office Supplies and tagged Recycled copy paper, Recycled Office Supplies, view binders, Zuma Office Supply. Bookmark the permalink.